The Plemo Trekking Pole provides enhanced balance and stability while you are hiking on rough terrains. It is versatile for daily walks, leisure hikes as well as adventurous treks. 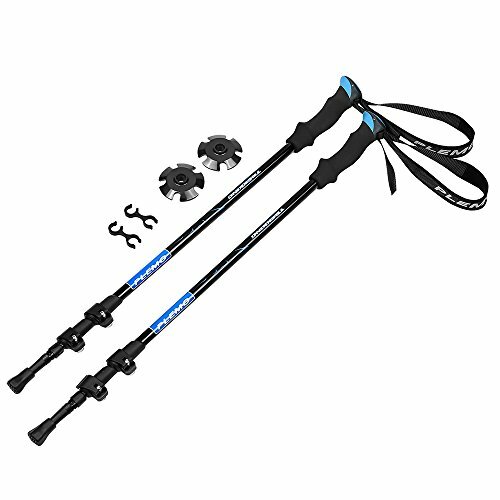 This 3-section trekking pole is made of super lightweight aircraft-grade 7075 aluminum alloy. It features a thickened tube wall, which ensures an extremely robust structure. The anti-shock system helps you keep a steady stride by reducing impact on your knees. Made of dual-density EVA foam, the grip effectively absorbs moisture and provides a comfortable fit in your hand. A wrist strap is added for extra stabilizing assistance in holding the grip, featuring a soft and breathable padding to reduce friction in your hand. The absorbent fabric on the outside ensures quick drying. Adjust the strap to rest snugly around your wrist. The Plemo Trekking Pole features an external locking system to guarantee all the segments are securely locked. The quick lever-locking system provides superior stability while preventing the likelihood of collapsing during your hikes. Use the external locking levers and bolts to open and adjust or close and lock the pole sections. Each section pole features precise markers so you can preset the length to match your height. The tungsten steel pole tip boasts extraordinary hardness and strong abrasion resistance even on rough terrains. The detachable mud basket spreads weight and prevents your pole from sinking in soft grounds such as snow-capped mountains, desert sands, and forests.